This is probally gonna stir up all the trad climbers but I really think that Elsies Peak could do with a couple of easier sport climbs. There are already 5 sport routes there so it is not an exclusive trad crag. I believe that its got some serious potential for development into a great sport crag. The views over False Bay are awesome. You're gonna get some flak for that one, let the abuse begin. My opinion is that there are only three (including the Ledge) trad crags around Cape Town, leave them be. Leave the trad crags be. Yes I expect some flak. Elsies Peak has bolted sport routes so it is not a (exclusive) trad crag. There are tons of trad routes on the ledge and Muizenburg ect. Maybe its time that the trad climbers go and find some more crags? I live within walkind distance of Elsies and don't see that many people on the crag. Maybe a better way of approaching this is are there any (easier) lines that cannot be tradded? Perhaps these could be bolted. If there are any classic trad routes these would be respected and not bolted. I just think that a couple of easier routes (17 to 22) and checking and fixing any dodgy bolts on Andy's routes would be really cool! When Clinton recently climbed Dream Street Rose, did he clip any bolts? Thanks Justin, thats a good point. Even if some trad routes are bolted the climber still has the choice of not clipping the bolts. By the way on his first attempt he had the wrong size cam and had to clip a bolt. Second attempt he made it. I'm afraid that Elsies is very much a TRAD crag, with a few unexplained, all tradded, sporty routes. Let the sport climbers find a new crag !! The trad guys have already found this one. Why on earth must every trad crag that isn't heaving with people every day be written off and transformed into a sport crag. I lived within walking distance of Elsies for 20 years so have some connection with the place. Don't bolt where it isn't wanted. Three trad areas is nowhere near sufficient and too many trad areas have been stolen by the sport set already. Just climb past them he says...as a trad climber do you know how much it grates my carrot to find bolts where bolts are not wanted!!! I'd rather climb something or somewhere else. Bolts at Elsies will have a 10 year max safe crag life, but will be dodgy in 5. Natural pro lasts for ever... leave it natural. Especial so close to the sea. 4 bolted lines at Morgan Bay are soon to be chopped... they are verging on unsafe. All bolted since April 2000. Nature takes its course..even on the finest stainless. Sure they can be rebolted...but by who? When? How much? Who is rebolting The Hole, The Mine...? Now if you have bolts all over the rock it certainly isn't a trad area anymore - even if you choose not to use them. If you have time and energy to bolt routes thats fantastic, but I feel it would be better directed at developing new (preferably non-tradable) areas. That way everyones happy! I have only recently started climbing outdoors, and the whole trad argument doesnt seem to make a whole lot of sense to me, maybe it will after I have been climbing longer? The way I see it is there are so many sport routes to choose from that I dont see the point of wanting to convert trad to sport? If you are tired of climbing sport routes and you want to take on new routes and challenges then you have to decide do I want to take the leap (not intended) and start trad climbing. I like the idea that their are trad routes out there which are far lesser climbed than sport routes it makes the routes special (rather than well travelled) so maybe one day when I have sport climbed for long enough to be secure in my abilities I will take the plunge (also not intended - I think) and start trad climbing. It makes sense, to make everything sport just denies yourself a different experience and the possibility of progression. On the wiki it says Dream Street Rose is a sport route, but as far as I know it was opened on trad? Am I mistaken or has someone gone and bolted it? Re: Dream Street Rose... bolted or trad? It was retrobolted, with it's neighbour, a number of years ago. Apparently was too hard for the new generation. I do believe Clinton did the route on Trad a few years back. As a matter of interest, how many people have been on the route since it got bolted?? Not sure what the condition of the bolts are!? I did it a couple of months ago using the bolts. They held plenty of falls but look a little dodgy so who knows. Jeremy Samsom was fighting gravity that day and fell all over the place too. If they can keep his middle aged frame from hitting the ground then they should be solid enough for the rest of us . Might be a good idea to back them up with some trad gear though. Congrats to Gosia for tradding Dream Street Rose last Monday! Probably the first SA girl to climb 28 on trad!! Don't think I would trust those bolts at all anymore!! I hope there was someone with a camera nearby? Never climbed there, but since I've started trading in the Magalies and some other place I've come to value the different feel that the trad areas have. The trad area's really lose their magic if there are bolts or thousands of old pitons on the routes right next to placements. If the route is really that run-out(not hard) then place one bolt and use natural protection for the rest. when the time comes would it not be a good candidate for a removable bolt, as it is only one placement? Chris F wrote: I used to have the old Backpacker poster of AdK on it with a bunch of cams slung over his shoulder. I used to have dreams of doing it one day. This was the hardest route in SA (if not the world for a bit of time!?). Going at I2 (28). - Who took the photo? (the photographer is not mentioned on the poster). - What does Andy's T-shirt say? IIRC, the t shirt said "never stop.... something?" or I could be a mile off. Guess at photographer; Nick Good? Bonus; what does the route name reference? No googling. 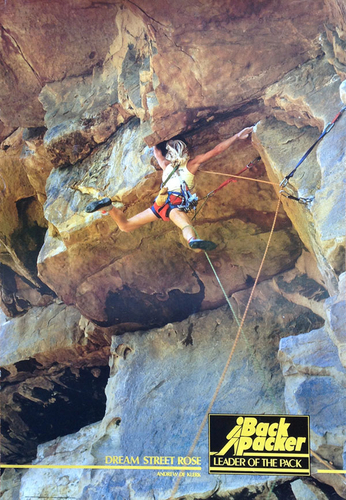 At the time America's hardest route was Grand Illusion graded 5.13. Apparently 13b by today;s standards. ADK is 17 in the pic. Free soloed by Ian Anderson in 1989. My guesses below, but I assume that Jeremy is correct. 'Remember to eat healthy' Margarine advertising!? Name ref - it was the 80's so it's from a U2 song!? Tell Jeremy that his memory is fading. It was an Ob's butchery but it said 'I'm tender soft and meaty'. Aren't those shorts just classic! @ Warren - there's no need for a removable bolt, because you can place gear at the crux (either a very large cam or a very small one). If Andy went to SACS... why is his hair so long? BTW, well done Gosia on the send, this route has been on my list of climbs to do since I started climbing.